Do You Really Need To Hire Furniture Movers Canberra? Have you ever moved before? If yes, do you remember a single part of moving that you really enjoyed? Certainly, your answer would be ‘no’, pretty much like many other people when it comes to moving. The situation can become more challenging and stressful when you decide on moving a big size furniture item by yourself. It will hardly bring out fun or enjoyment for you. But you need not to worry here, as you still have plenty of options to choose from small or big furniture movers Canberra, as per your moving needs. If you are also looking to move at a new exciting place along with your big size furniture items such as a cupboard, dining or pool table, and piano etc., without any trouble, but you are still not convinced, why should you hire an experienced and reliable furniture movers Canberra? During a moving process, it could be hard to predict for you how much time it could take to pack all your households and other valuable furniture items by utilizing suitable and secure packing supplies and equipment. In such a situation, a professional furniture removalists Company can help you save time with a proper planning to move your valuable stuff, doing arrangement of all needful items to make sure a trouble-free move, and, above all, they take care of all loading and unloading of items to let you focus on other important things of the move. Denying any professional help of furniture movers, it wouldn’t easy for you to move an awkwardly shaped furniture item to get in and out of a home without any damage. So, you can rely on one of leading and experienced movers Canberra having years of proven expertise to handle any sorts of furniture removalists jobs, safely and seamlessly without a scratch. moving cost quickly. Some of them are mentioned as, purchase of packing and other needful supplies, renting a suitable moving truck, and the total time taken to finish a move. 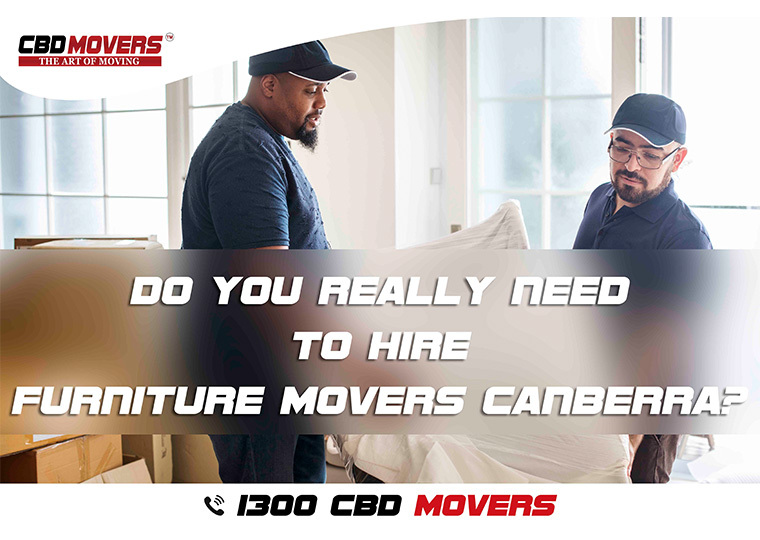 So, it is definitely worth for hiring one of the trusted movers Canberra, like CBD Movers Canberra that can help you save your time and also let you overcome the headaches as well. Next PostNext Enjoy Special Removals Deal on Every Tuesday!